1.Install the app on your phone. 2.Plug in the OBD2 adapter. 3.Turn on the car and start the engine. 4.Enable wifi on your phone and connect to "WiFi_OBD2"
【THE MOST EFFECTIVE OBD SCANNER AND CAR CODE READER】Professional diagnostic and instantly transform your car into a Smart Car! This is a top quality auto diagnostic scanner. This OBD2 Scanner can read generic and manufacturer-specific trouble codes and its database includes over 3000 code definitions. 【SMART AND EXCELLENT COMPATIBILITY】Powerful compatibility. 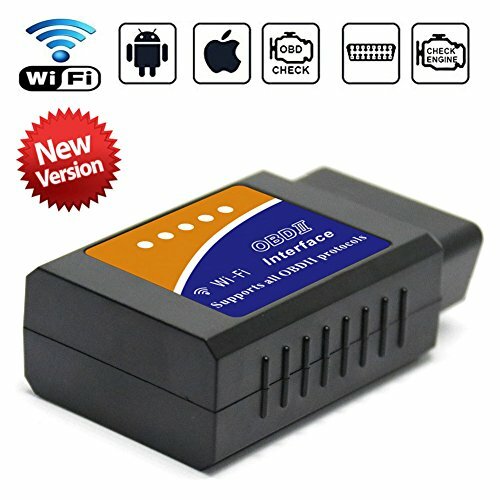 This WIFI OBD2 scanner works on ALL 1996 and newer PETROL cars sold in the United States, including all American, European, and Asian vehicles. Supports OBD-II protocols: ISO15765-4 (CAN), ISO14230-4 (KWP2000), ISO9141-2, J1850 VPW, J1850 PWM(May not support truck, van, Hybrid or electric vehicles). 【SUPER EASY SETUP】Just connect to your Android phone/tablet or Windows PC using a 3rd party app. Recommend Apps including DashCommand, Torque Lite,Torque Pro, etc, on Google Play. Work with Android & IOS device. 【UPGRADED VERSION】This is 2018 new version of the WIFI OBD2 Scanner and Check Engine Code Reader. Upgrades include improved WIFI signal range, enhanced app compatibility, upgraded components, and NO CD. Our EML327 Hight Quality Than Other In The Market After Updated. Our OBD Diagnostic scanner and Check Engine Light Eliminator is made with top quality materials for optimal performance and durability. 【100% RISK FREE PURCHASE】Place order now to enjoy the convenience of Free Lifetime Technical Support and a 36-Month Manufacturer's Warranty. If you aren't 100% satisfied, we offer a hassle free replacement or full refund within three months! If you have any questions about this product by KONNWEI, contact us by completing and submitting the form below. If you are looking for a specif part number, please include it with your message.